The marker is made up of three panels near the sculpture of the Lophorhorthon group. This is the first of three panels. 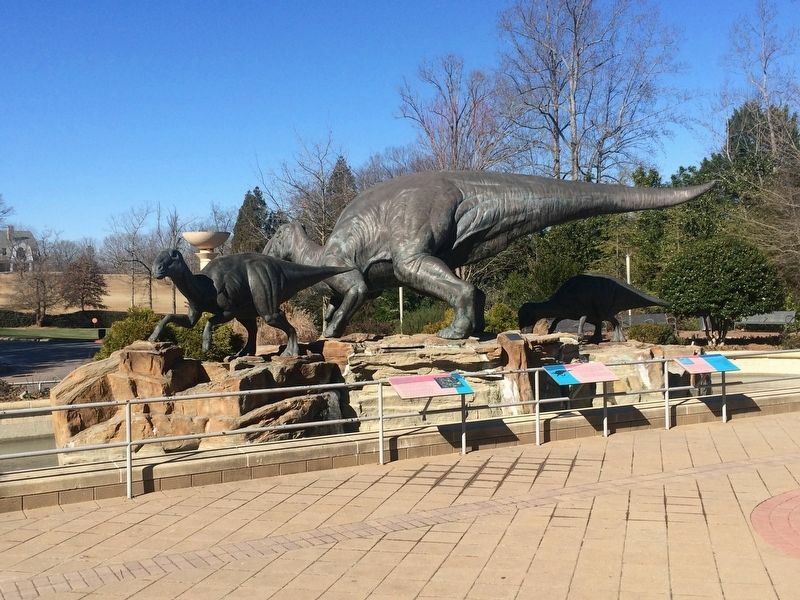 This scene shows a family of Lophorhothon dinosaurs, as they may have looked millions of years ago when they roamed Georgia and the Southeast. Adults grew up to 35 feet and weighed 3 to 4 tons. They typically walked on two legs, but could get down on all four legs to eat and drink. 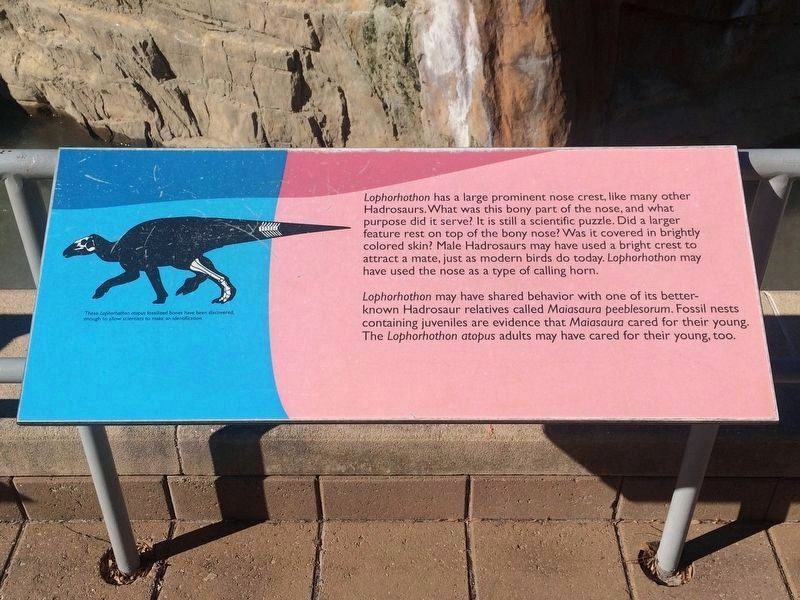 Lophorhothon belongs to the family of dinosaurs known as Hadrosaurs, commonly called duckbills because of their duck-like snouts. Hadrosaurs were herbivores, and most likely ate a variety of plants including tree foliage and ferns. Their mouths contained hundreds of teeth arranged in overlapping rows, which allowed them to easily clip and grind vegetation. Caption: Artist's impression of Lophorhothon atopus in a typical Southeast Cretaceous Period forest. This is the second of three panels. puzzle. Did a larger feature rest on top of the bony nose? Was it covered in brightly colored skin? Male Hadrosaurs may have used a bright crest to attract a mate, just as modern birds do today. Lophorhothon may have used the nose as a type of calling horn. Lophorhothon may have shared behavior with one of its better known Hadrosaur relatives called Maiasaura peeblesorum. Fossil nests containing juveniles are evidence that Maiasaura cared for their young. The Lophorhothon atopus adults may have cared for their young, too. Caption: These Lophorhothon atopus fossilized bones have been discovered, enough to allow scientists to make an identification. 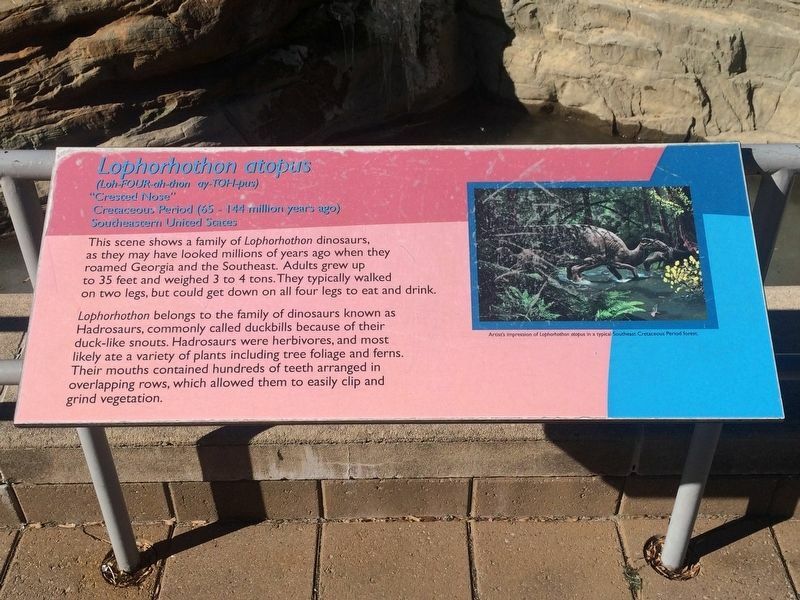 Lophorhothon fossils have been discovered in bits and pieces in areas of the Southeast that were covered in a Cretaceous ocean. How did this land animal end up scattered in the salt water depths? Scientists have learned Lophorhothons that died near the ocean were lifted from land by tidal action, carried out to sea, and then nibbled by sharks and other sea life. Caption: Map showing locations of Lophorhothon fossil discoveries. This is the third of three panels. Erected by Fernbank Museum of Natural History. Location. 33° 46.457′ N, 84° 19.691′ W. Marker is in Atlanta, Georgia, in DeKalb County. Marker can be reached from Clifton Road, on the right when traveling east. Touch for map. 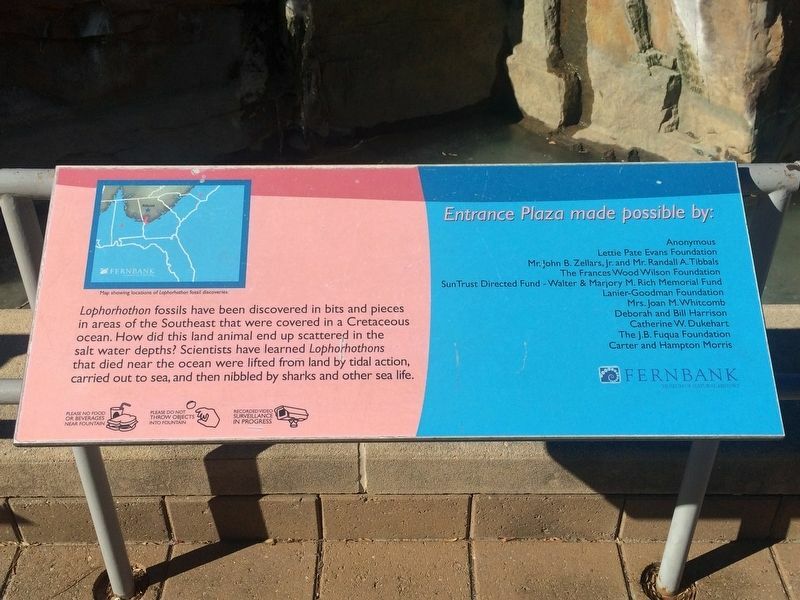 The markers are directly in front of the entrance to the Fernbank Natural History Museum. Marker is at or near this postal address: 767 Clifton Road, Atlanta GA 30307, United States of America. Touch for directions. Other nearby markers. At least 8 other markers are within 2 miles of this marker, measured as the crow flies. Georgia Railway and Power Company Trolley Waiting Station (approx. 0.4 miles away); Alpha Delta Pi (approx. 0.8 miles away); Sweeny's Division Encamped (approx. 0.9 miles away); Site: Judge James Paden House: Gen. J.D. Cox’s H’dq’rs (approx. 1.1 miles away); Noon Under the Trees (approx. 1.1 miles away); Old Williams Mill Rd. (approx. 1.2 miles away); The March to the Sea (approx. 1.2 miles away); Closing the Gap (approx. 1.3 miles away). Touch for a list and map of all markers in Atlanta. 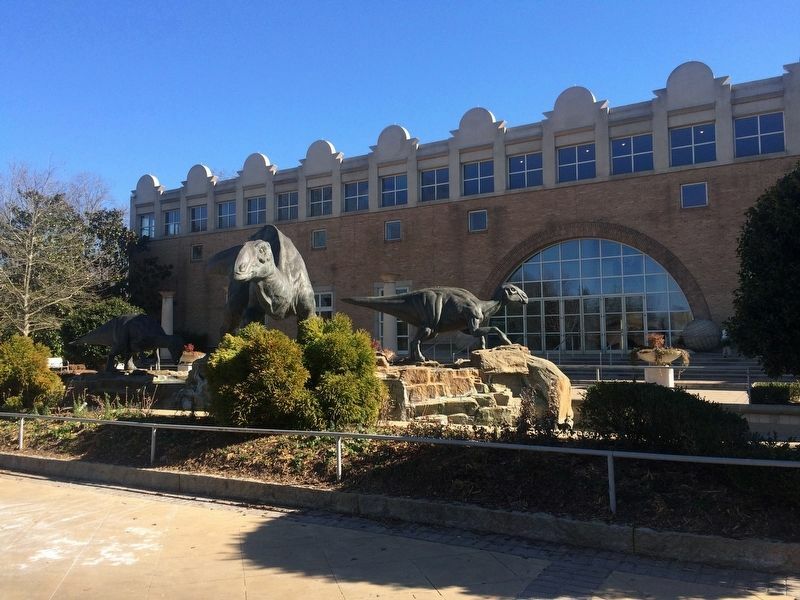 The markers are directly behind the sculptures in this view, with the Fernbank Natural History Museum in the background. More. Search the internet for Lophorhothon atopus. Credits. This page was last revised on February 2, 2018. This page originally submitted on February 2, 2018, by J. Makali Bruton of Querétaro, Mexico. This page has been viewed 102 times since then and 8 times this year. Photos: 1, 2, 3, 4, 5. submitted on February 2, 2018, by J. Makali Bruton of Querétaro, Mexico.